You are here: Home » Shower Remodel » Space challenged bathroom? Try a corner shower! A corner shower can be a great alternative for those of us who have a small bathroom. Corner showers make use of the space around our bodies better than a traditional rectangle shower, which translates into space saved. Corner showers can also make a bathroom look sharper and more modern as well, due to their unusual shape. 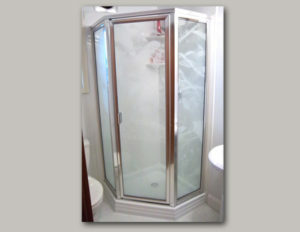 Best Fit Bath has a lot of options for corner showers and shower remodels. Call and ask him to help you design your perfect small bathroom with a corner shower!